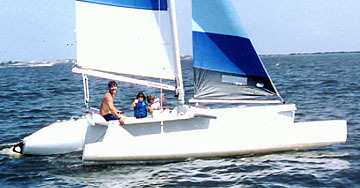 This trimaran can carry 4 people with gear on speedy day trips. It can use many available beach-cat rigs. Shown is one with beach-cat hulls as amas also. The stock amas are larger. Gear can be put in a protected cuddy or inside the front of the main hull. It is built with the rapid plywood/epoxy CM construction. It can be built to get narrow rapidly with the sliding-tube Mono-slip connectives option.